Personal Ancestral File (aka PAF), the popular genealogy database program, once again became the topic of conversation in classes I taught this past week. In checking on GenSoftReviews.com, I find that PAF is still rated at 4.5 overall with 50 reviews. There is a note that says, "The final version is 5.2.18.0 (2005) and is still available at Parowan Software." Here is a screenshot of the Review. Personal Ancestral File has been available free for many years and has a large following. The LDS stopped offering PAF downloads or support on July 15, 2013. The final version is 5.2.18.0 (2005) and is still available at Parowan Software. The key word here is "unsupported" and actually, the last full upgrade of the program was in 2002. It is now over 14 years since the program was last upgraded and going on 3 years since all support was terminated. I began to think more about this situation when March 21, 2016 became one of Apple's new product introduction days. The new products being introduced and yet to come are based on a major upgrade in the Intel Chipsets now into the 6th generation and code named Skylake microarchitecture. The discussion about PAF centered around a recent memo from the technology support section of the Brigham Young University, Harold B. Lee Library concerning devices and processes that they would no longer support. In short, the days when a person can walk in and have a file recovered from a 3.5 inch floppy disk are quickly ending. I was also essentially in the middle of a support situation for a friend who is trying to work with a computer running Windows XP and at the same time losing his Internet connection with an old tablet mobile device. These situations always remind me of years ago when I was trying to buy parts to keep an old Jaguar automobile running. Perhaps you can get a feel for the situation by reading some of the comments in the reviews of PAF on GenSoftReviews.com. I have edited some slightly to remove references to individuals etc. Many of these comments are heart rending and I wish I could help solve some of the situations. I really need help… I used PAF from back in the 90s and now I guess there are replacements I should try …. So far the ones I downloaded have been completely different and at 82 I’m struggling…I’m still running my PAF but should I really change??? I could go on and on with the comments but they are making my stomach hurt. Here is a long comment that summarizes some of the issues involved in this technological conundrum. This software was, is and remain the best of all genealogical products. I used PAF during 15 years, without problem on Windows 95 to Windows 7. But when my file reached 40′000 persons, I lost data (mainly a mother, why ?). This problem was solved with a computer at 32 Go RAM on Windows 8 (instead 8 Go). Now I have more than 90′000 persons on my main PAF file, without lost of data. b) I can display only date and place of birth on the Individual list. => This is the only reason for me to search an other software. I regrets - but understand - the decision of LDS to stop devlopment for PAF. Microsoft was the killer of the excellent WordPerfect for Windos. Wy LDS will not give the source code of PAF to an Open Source organization ? This comment opens up a whole long list of issues which I can hardly begin to address. Can you imagine the amount of work that must be involved that is totally dependent, apparently, on 14 year old code that may stop working at any time. I am presently working on a computer that is in the last stages of dependability. I have been waiting for the new product announcements to make a final decision on upgrading my hardware. 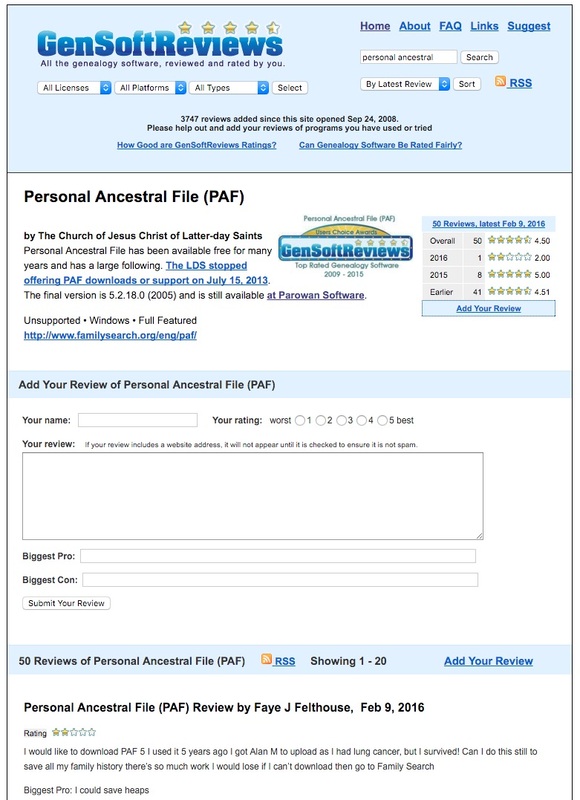 I thought PAF was good program for many years, but today, genealogy has moved on to online connections and programs that help manage large files. I cannot imagine what must be in that file of 90,000 individuals, but the mere fact of its existence illustrates one of most serious gulfs in genealogical world today.